The Second Reading of the Higher Education and Research Bill in the House of Lords will take place on 6 December. Members of the House of Lords rely on information from the public. 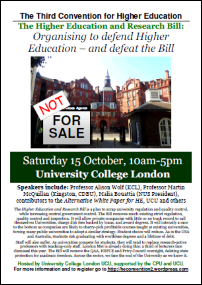 Please help them stand up for Higher Education. Send a letter to a Lord today explaining why you believe the HE Bill will be so damaging to HE. Use this online tool to send a letter (courtesy of UCU). 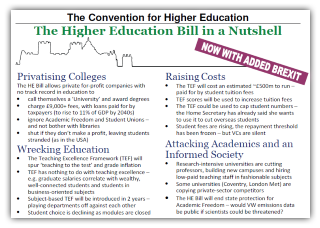 The Convention for Higher Education has published a letter-writing pack for the Lords, which contains arguments you may wish to use.